Browse for quality women’s work blouses and work tops at our online uniform store. We carefully select our range of blouses and tops to suit for casual and corporate work environments. 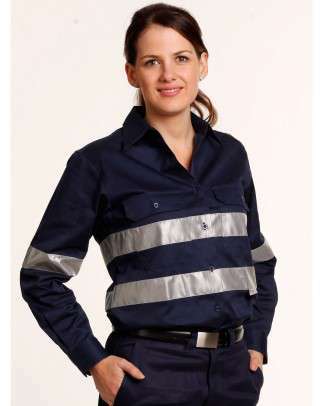 We also make sure that we keep up to date with changing trends in women's work wear, especially in Australia. What's more is that you could brand your work shirts and blouses with your company's logo with our quality embroidery and screen printing services. We are one of the very few suppliers of women's work shirt with pocket. Made from fine cotton, this shirt promises genuine comfort, stylish look and durability. The pocket shirt is available in women's sizes of 6, 8, 10, 12, 14, 16, 18, 20, 22 and 24. Here at Uniform Choice we ensure that many of our style of shirts are available in different sleeve lengths. For example, our ever popular ladies chambray shirt is available in short sleeve, as well as in 3/4 sleeve length. Of course, we also provide women’s work shirts with long sleeves. So, no matter what kind of sleeve you prefer, you can find it at our workwear store online. If you are one of those women who prefer to do something other than ironing her shirt, then you might be please to know that we have expanded our range of wrinkle-free work shirts for women. The traditional women's chambray shirt has made a good reputation for being easy to care and wrinkle free shirt. Manufactured by Winning Spirit brand, which is a well-known workwear brand in Australia. You can now order your 3/4 sleeve wrinkle free shirt easily at our online workwear shop. Of course, we also supply ladies short sleeve chambray shirt throughout Australia. Women's Work Shirts in Women's sizes. If you enjoy a feminin look in your work shirt, then you chose from our wide range of shirts for women in actual female sizes. Our sizing range for starts from as small as size 6. Sizes increase by 2. For example, the next size from 6, is 8, and the next size is 10, and so on. Most of our works shirts for ladies also goes upto size 24. Given such a wide women's size range, you are sure to find a shirt that fits perfectly on your body. Not all ladies like to wear bulky, musculine style shirt for work. If you are one of those ladies, then you are in the right store. We offer extensive range of stylish work shirts for women of all shapes and sizes.So, dress up for success with a quality sharp looking shirt. Tough Work Shirt for Tough Women. Women who work in tough work environments needs a tough shirt to handle the job. 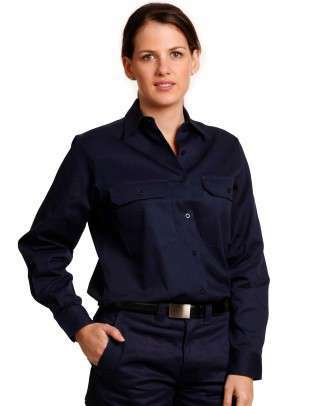 While we offer cotton drill shirts for women, we also offer lightweight work shirt that is built for tough environments. Check out our range and order one today. Style up for summer with our sharp and stylish women’s corporate and work shirts and blouses. Over the years we have discovered many secrets of beating the Melbourne's changing weather, one of which, is a quality shirt made from a quality fabric. For this purpose, we recommend a work shirt that is made from quality cotton. There are many advantages of cotton fabric. Amongst other benefits, it provides both the comfort and weather protection, which makes it ideal fabric for the ever changing Melbourne weather. For Sydney, however, most of our customers prefer a shirt made from a blend of cotton and polyester. This type of women's work shirt is comfortable, as well as fairly light, which is ideal for Sydney’s fairly study summer days and nights. So, whether you want to beat Melbourne’s changing weather, or Sydney’s warm summer, you are sure to find the right shirt at our online uniform store. Uniform Choice is proud to be one of Australia's leading uniform supplier to offer fast shipping and free delivery options. Our years of experience in the uniform and workwear industry, had shown that some customers wanted their work shirts fairly fast, while others were happy to wait a little longer. If you are in a hurry to receive your shirt pretty fast, we suggest you to pick the fast shipping option at the checkout. However, if you are not in a hurry for your order, our free delivery option might be the right choice for you. We used to offer free delivery from our Melbourne and Sydney locations. Recently we have expanded our free delivery areas to include Brisbane, Perth, Adelaide and Canberra. We also provide free delivery to all major towns in Australia, for as long as they are within the delivery zone of Australia Post. Work uniform is an essential element of branding. This is precisely why we make sure to offer you quality embroidery and screen printing services. The time frame for the branding process is approximately 1-3 weeks, depending on your response time. Our aim is to provide a complete uniform and workwear service. This is why we maintain very low prices for our embroidery and screen printing. This also saves you lots of time and frustration, not to mention the huge savings.